Kerry is right, though. The Robotic Nation is upon us, stealing our jobs but making our lives easier at a rapidly evolving pace. Earlier this month a robot surgeon performed an entire procedure. Although the procedure was performed on an animal test subject, it prompted CNN to ask what may become the ultimate question. Would you let a robot perform your surgery? It’s strange to see robots doing tasks that have traditionally been performed by humans — and we may be seeing more of them soon. Three restaurants in China have already implemented robot waiters, though the results were apparently unsatisfactory. Two of the restaurants ended up closing, according to CNN, and one staffer complained that the robots broke down frequently, and had trouble when delivering bowls of soup. And one Hong Kong product designer recently built an eerily lifelike robot likeness of movie actress Scarlett Johansson, with silicone skin and a face that can mimic expressions, plus a mechanical/electronic interior that was mostly generated by a 3-D printer. So maybe someday we’ll see a restaurant where every waiter is a robot that looks like Scarlett Johansson? Other companies are eagerly anticipating a day when robots aren’t just in the workplace — they’re in our homes. In April a Palo Alto company called Ingen Dynamics launched a campaign to build a next-generation “home robot” — an open-platform android that can function as a combination personal assistant, baby monitor, and home security system. Within weeks, the company attracted $488,513 from 945 backers, more than six times their original goal, and including over $300,000 in pre-orders for an “early bird” edition, which went for around $550. (“Plus shipping”…) Aido is described as an “interactive and friendly home robot” — and it’s certainly one way to prepare your children for a world filled with robots. But the next generation already has some hands-on experience with robots, judging by the FIRST robotics competition. For 25 years, high school students have been building robots for the FIRST competition, and this year over 20,000 students descended on St. Louis Missouri for a massive 900-team competition. And for decades, humans have been conjuring robots with our creativity, anticipating what a robotic future will look like. And the history of these robotic visions (omens?) is, in of themselves, quite fascinating. There’s now robot exhibits at museums in Chicago, Boston, Pittsburgh, St. Louis, Denver, and even in Bozeman, Montana, while next year London’s Science Museum will finally open its massive exhibition of robots, collecting 100 different “humanoids” from around the world, including a 16th-century “mechanical monk” — an “articulated” iron mannequin. Whatever happens, the future is likely to be very interesting. 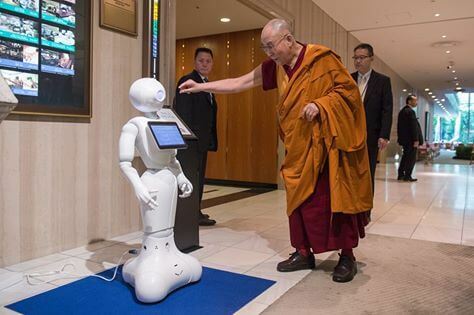 One group even says that in 2012 it received the Dalai Lama’s blessing for a project to build a humanoid robot linked to a human brain, as part of a larger project to eventually house an individual’s consciousness within “artificial carriers.” The Dalai Lama said the project could help scientists understand the mind and on Tuesday the Dalai Lama was spotted with an actual robot in Osaka, Japan during a lunch break at the start of a four-day teaching visit. But of course, we humans had to have the last laugh. 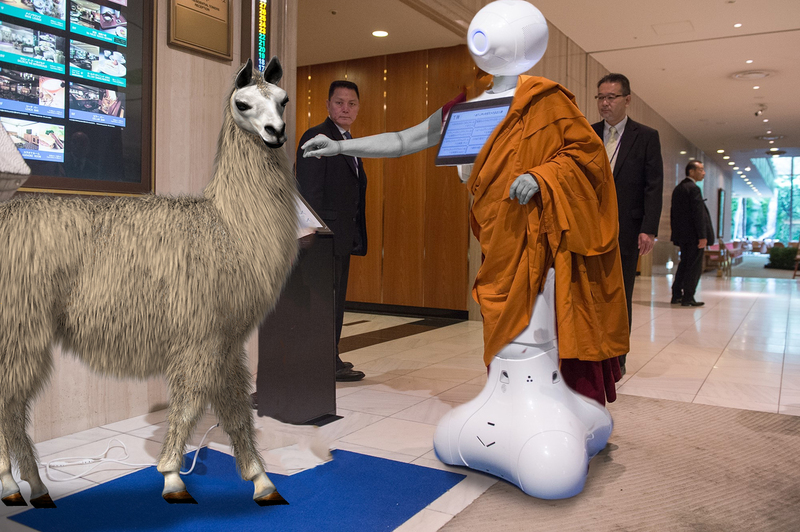 The startling photo prompted a wacky “PhotoShop Battle” on Reddit, where users re-mixed his Holiness into unlikely situations — in one case, replacing him altogether with a robot who was blessing a llama. Take that, Robot Overlords of the Future! 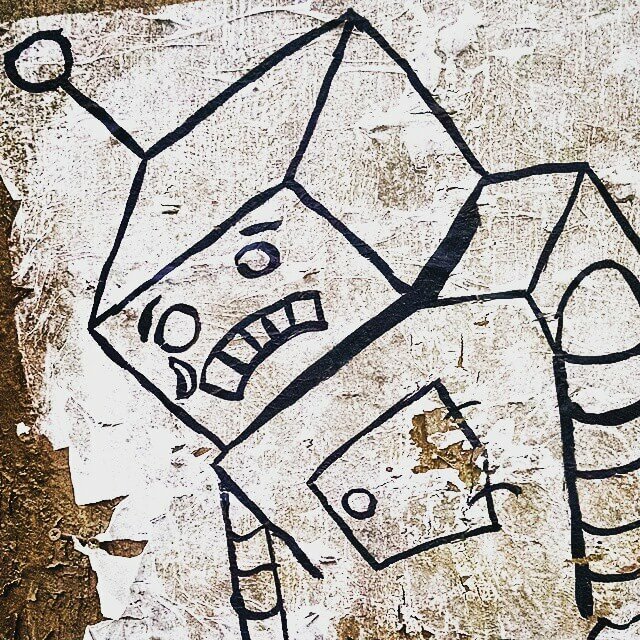 Feature image: “No Place for a Sad Robot,” Chicago street art.